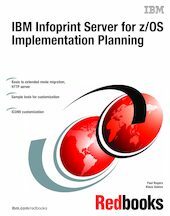 This IBM Redbooks publication provides installation and customization information and samples to help you implement IBM Infoprint Server for z/OS. Infoprint Server is an optional feature of z/OS that uses z/OS UNIX System Services. This feature is the basis for a total print serving solution for the z/OS environment. It lets you consolidate your print workload from many servers onto a central z/OS print server. Infoprint Server delivers improved efficiency and lower overall printing cost with the flexibility for high-volume, high-speed printing from anywhere in the network. With Infoprint Server, you can reduce the overall cost of printing while improving manageability, data retrievability, and usability.